I am not currently selling. Enjoy your visit to ModColors.com. 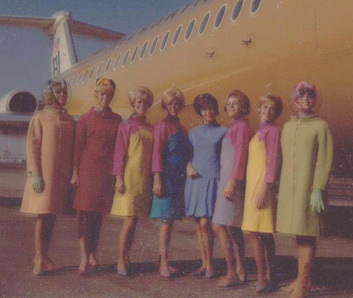 The uniforms on this page are from my years with Braniff, and from my personal collection. This photo is from a promo slide. 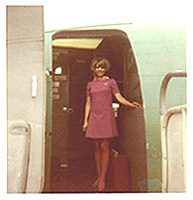 Although not very clear, it's part of my personal history with Braniff. 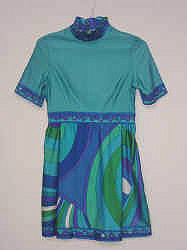 1965 Gemini IV "The Air Strip"
This first Pucci multi-component design for Braniff, dubbed "The Air-Strip", combined colors new to flight uniforms. A lime wool coat, reversible to apricot, was worn with lime or apricot gloves, and two-color stitched boots in a Courrèges style. 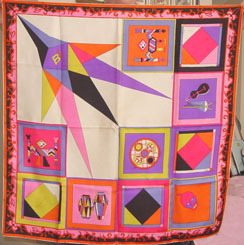 They were accompanied by a Pucci print pillbox hat with attached scarf tied under the chin. A space helmet (far left) was worn for passenger boarding. Inflight, two-color stitched flat shoes replaced the boots. 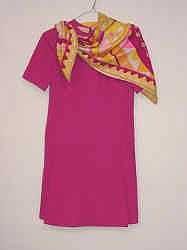 A Pucci Pink (magenta) two-piece wool suit (second from left) was removed to reveal a blue silk turtle neck tunic and culottes (center), over which an apron-dress called a "Puccino" (left and right of center) was worn for the meal service. The culotte "lounging outfit" was worn for the remainder of the flight and passenger disembarkation. All items on this page will remain in my personal collection. They are not for sale. Gemini IV Scarf with 'BI' logo. 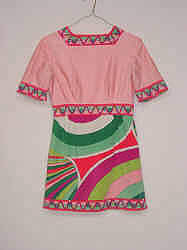 1966 Pucci II "Ports of Call"
As an alternative to the culottes and tunic, Pucci added a 100% nylon dress, in three color variations, with a string belt and tights in a pattern "symbolizing the nations of the world that serve as Braniff ports of call". A bowler style hat replaced the pillbox and helmet. 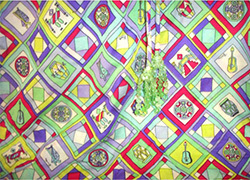 Clear shoes, with various trim colors, were designed by Beth Levine to allow the Pucci pattern to show through. 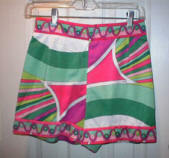 In a harlequin pattern (see close-up), Pucci intermingled his stylized flags with Mexican instruments and Pre-Columbian Art of Central and South America. Many might wonder if plum (fuchsia) uniforms can be considered classic. 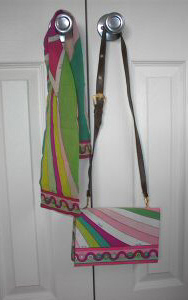 In any case, this was a monotone color scheme, with a splash of colors in the scarf. 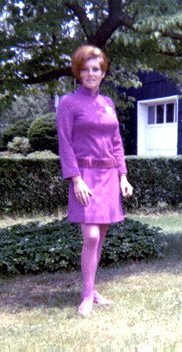 The dress was plum or pale pink Trevira blend, with matching hose and shoes. 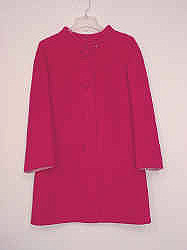 The wool coat was reversible pale pink/plum. 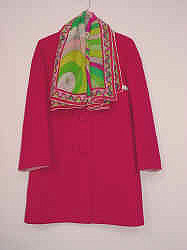 Navy blue luggage with a plum and pink stripe band coordinated with this Pucci uniform. My friend Phyllis welcoming you aboard. This uniform was designed for the Passenger Services and Flight Operations at airports. A variation of the plum uniform, with a mandarin collar, three-quarter length sleeves (which we pushed up out of the way), front zipper and dropped waist with a suede belt. A faux leather belt replaced the suede belt in 1970. That's me, looking quite a bit crumpled, after the long drive home from work in the Summer of 1969. The Pucci print returned with this uniform, as did versatility. 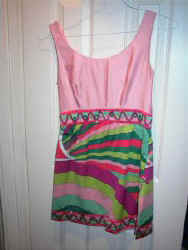 The color choice was pink or blue, with a square neck, ruffle neck, or sleeveless scoop neck. 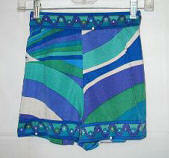 It could be worn knee length, above the knee, or mini length with 'palazzo' trousers or with hot pants. The uniform was a lightweight Qiana, and very comfortable. The shoes had one green heel. Matching patterned scarves had the 'BI' logo. 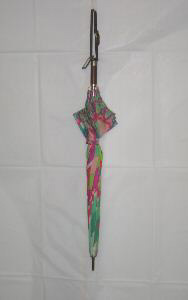 This time, Pucci added a purse and an umbrella. Rarely seen except in promos, they were really quite impractical. Lingerie was also available to us in the 'Pucci IV' pattern. 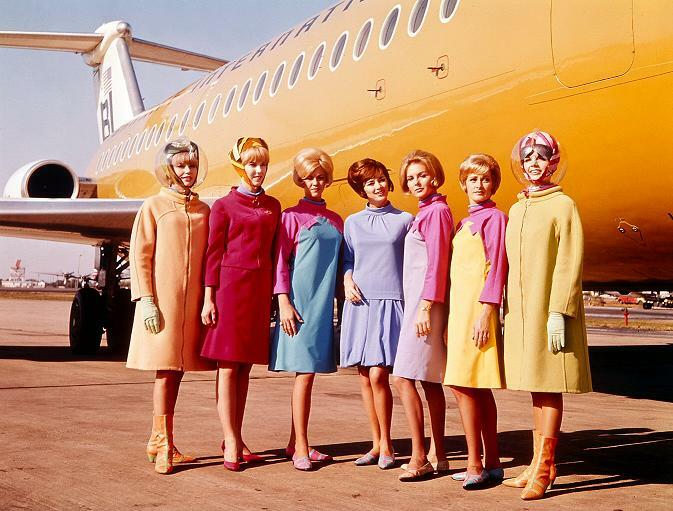 This was the uniform for the Passenger Services and Flight Operations at airports. 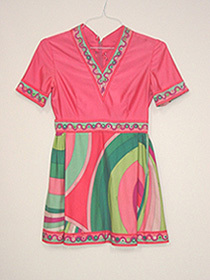 A variation of the pink uniform, styled with a v-neck and the darker pink bodice. 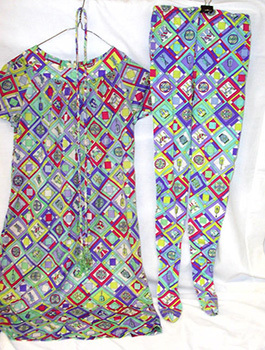 Palazzo pants matched the bodice. I wore the uniform shortened from the original length, as did most of us, with my palazzos cut to shorts length for the Summer. Much cooler and more practical! Qiana was lightweight, but it still clung on those hot Summer days. 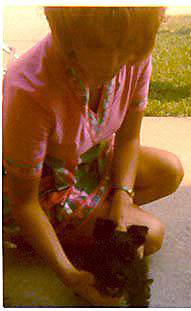 ~ Right ~ Playing with my Scottie puppy after work in 1973. 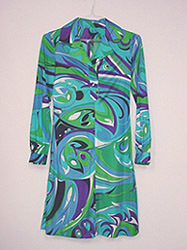 A combination of solid color and a magnificent swirling design was the final Pucci uniform. 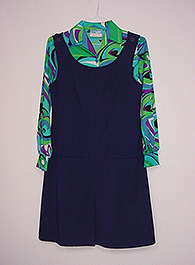 The polyester jumper in green or a turquoise blue could be worn alone (but rarely was), with the patterned nylon leotard, or a turtleneck sweater. with matching slacks as an added component. 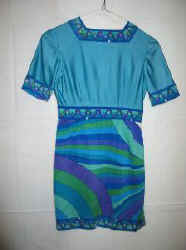 A front-placket buttoned nylon dress in the same colors as the leotard was the final choice, the Pucci VI. 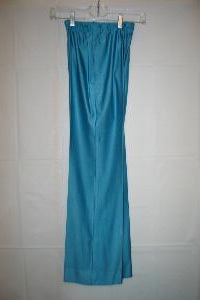 It was usually worn with a string belt. 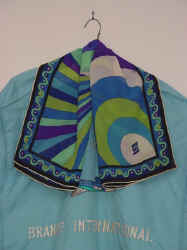 The meal service apron was half turquoise, half green with opposite color pockets. A reversible turquoise and green wool coat, matching bolero hat, and turquoise and green Baldino shoes completed the uniform. 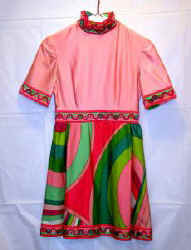 Trivia: Originally, the Pucci V leotards were issued with signature fabric covered shank buttons. However, in 1976 the "Braniff International" label changed to "Louis Chaney of Dallas", and the beautiful shank buttons were replaced with flat translucent silver gray buttons. Each cuff bore only one button, rather than two. Perhaps it was decided the fabric buttons were too difficult or expensive to replace, as they did catch on everything, and thus deemed impractical. I'll never know, but I doubt that Emilio Pucci would have approved of using plastic buttons on his design. Just my opinion. 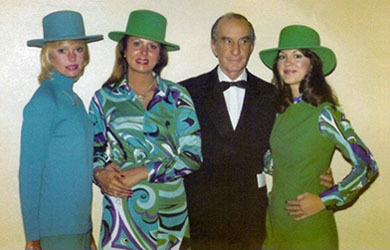 My friend Kay (right) with Emilio Pucci. 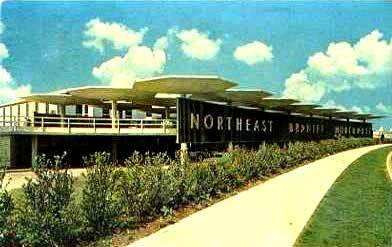 This was the uniform for Passenger Services and Flight Operations at airports. 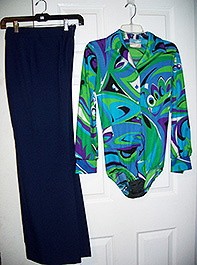 The jumper and pants were navy blue, worn with the same patterned leotard. 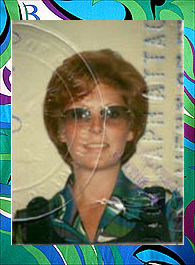 ~ Center ~ My passport photo in uniform in the Winter of 1975. Skippin' over the ocean like a stone.